A cake even I can’t mess up! – No crust, no rolling, just 4 key ingredients and delicious apples! But there is hope! Even for people like me that were born without a whisk in one hand and measuring cup in the other there are luckily some fool-proof recipes. One of the few cakes I have mastered is the humble apple cake. Trust me, if you are able to peel an apple you have all skills necessary to make a delicious apple cake! Depending on how fast your apple peeling and cutting skills are, you may want to keep the apple slices from browning. Place the slices from the first apple in a bowl with some water and add a squirt of lemon juice. Repeat with the other apples. Before adding the apple slices onto the cake, drain them in a colander and shake around a bit to get rid of most of the water. So easy, so delicious! Trust me – literally everyone can do this! Whip up some tasty tasty batter! Preheat an oven to 200°c (fan works best). Mix flour, sugar, eggs and cream, with cinnamon, vanilla sugar and a pinch of salt in a big bowl until you have a smooth well-combined batter. Use a hand-mixer (the easy way) or whisk (your excuse to skip the gym). Peel the apples, remove the core and cut into thick or thin slices. Up to you, everything works! Pour batter onto baking tray. 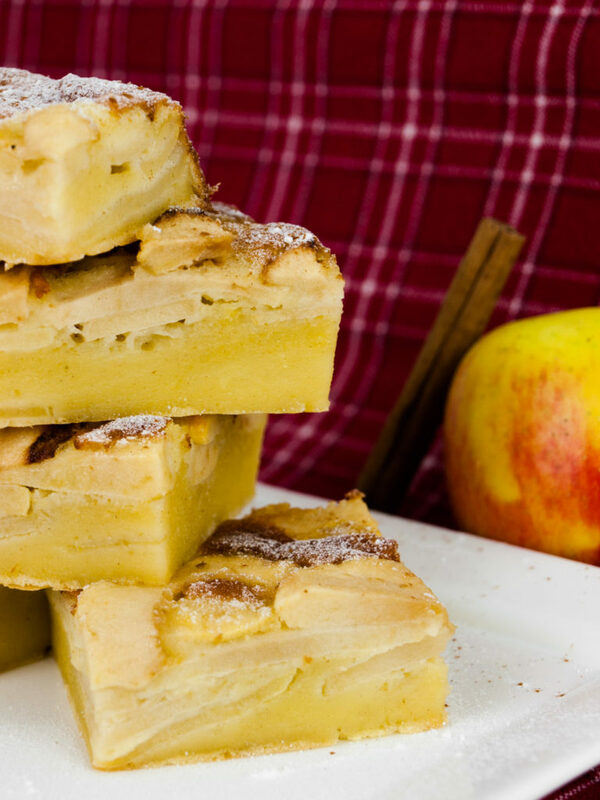 Push the apple slices into the batter. Try to make a neat little overlapping roof single pattern with the apples. Sprinkle brown sugar on top of the cake and bake in the oven for 20-25 minutes until well browned. Let the cake cool, slice it and serve with a proud smile! Hint: A scoop of vanilla ice-cream on-top of warm cake never hurt anyone. Let me know what you think about this cake? It is as easy as I promised, right? Do you think an easy extra ingredient would make this stand out even more? As always, all your comments are welcome! Next Post Just having the best time in Porto, Portugal!